Now that you have created a menu (the list field) to display your videos we will look at how to populate the menu so that it displays a list of available videos. This lesson will introduce revTalk for the first time in the application. revTalk is the language you use in Revolution to control what the application does and how it responds to user actions. So far we have discussed the Stack window, the Player and the List Field. Now we will introduce the Card object. A Stack window is made up of one or more Cards. A Card can contain multiple objects such as a Player or Field. We are going to add the revTalk necessary to populate the List Field to the Card Script. The Card Script stores revTalk that can affect any object on the card. 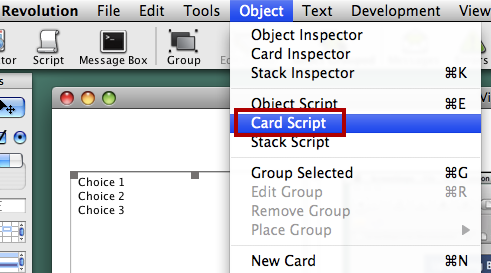 To edit the Card Script choose Object > Card Script. When you edit the script of an object you use the Script Editor. The Script Editor enables you to write revTalk that affects the behavior of your application. 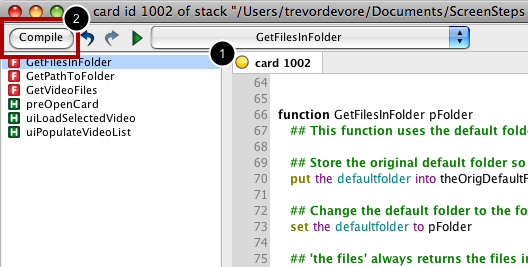 Notice that a tab is open in the Script Editor for the Stack window's card (1). We will begin typing revTalk into the script field (2). Below you will find all of the revTalk that goes in the Card script. If you would just like to copy and paste all of the code into the Card script without worrying about what it does then you can do so. If you would like to walk through writing the revTalk that goes in the Card script then skip the next step go to the next lesson which describes the Card script in detail. Copy and paste the following revTalk into the Card script. After pasting the revTalk into the Card script the dot in the Card's tab will turn yellow (1). Click the Compile button (2) so that Revolution applies the changes you've made to the Card's script. ## Retrieving paths to folders that are relative to the stack can be tricky. ## individual sections of the path by the 'item' token in revTalk. 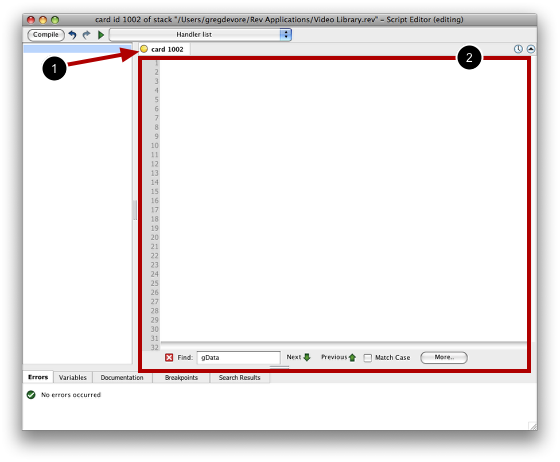 ## lines strip the application bundle portion of the path off. ## alongside the stack file or the application executable. How do I get the code above to copy correctly? At the moment it copies all on one line and has '?' at the end of every line of code? you can copy the code by first placing it in a text editor and the copying it from there into the LiveCode script editor. This should remove the '?' for you. It sounds like the line of code where you set the defaultFolder property is failing, these are the files in the LiveCode distribution which is what the defaultFolder is set to when LiveCode starts up so it sounds like it is not changing successfully. Double check that line of code, and the folder path you are using there and you should be able to get it working. Would someone please show what to do in code. I don't understand Elanor's solution. I have followed the tutorial and everything works fine until I install it on my Android Phone. Then, I get the same list as Daniel shows above. It would be nice to have more explanation the folder and file paths. Something that shows a non defaultFolder or, at least, demonstrates what a defaultFolder property is. Getting the files will always return the files that are in the default folder, this is the folder the app is currently 'looking in', if that makes sense. If you want to app to get the files in a particular folder you have to set the defaultFolder property to the folder you want to look in. You can read a bit more about this in the Dictionary entry for the files function. Please note that this lesson is aimed at Desktop platforms, if you want to run it on Android you'll need to ensure you set the folder to something relevant, you might want to use the specialFolderPath function to find the path to the folder you want. I hope that is some help.